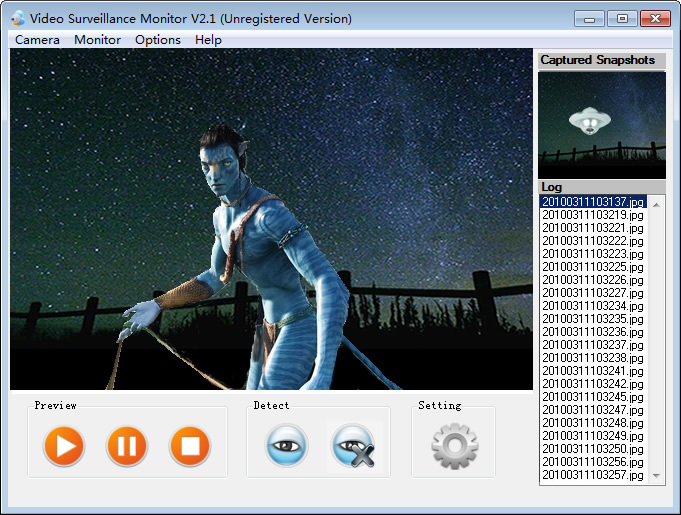 Webcam Surveillance Monitor is an advanced video surveillance software. Users can effortlessly monitor home, office, cradle, parking area, storehouse, UFO or any other premises 24-hours a day. Timestamped image recording let users capture details of events precisely when they happen. Simply connect a USB or FireWire Camera to your computer, run this program, then you will have an inexpensive and effective video surveillance system. ...... Simply connect a USB or FireWire Camera to your computer, install Webcam Surveillance Monitor, then you will have an inexpensive and effective video surveillance system. Webcam Surveillance Monitor provides Customizable Alarms like Audio Recording, Music Songs, and 3 kinds of default alarms. Also your can reset the Volume by mouse click or drag. The Sensitivity Setting helps you to configure the sensitive degree of your video surveillance system. And the Snapshot setting supports customizable path which is used for saving Activated Snapshots. You can also preview those snapshots in the Log area on the main board. Webcam Surveillance Monitor lets you take advantage of the potential of PC based video surveillance. Qweas is providing links to Webcam Surveillance Monitor 2.2 as a courtesy, and makes no representations regarding Webcam Surveillance Monitor or any other applications or any information related thereto. Any questions, complaints or claims regarding this application Webcam Surveillance Monitor 2.2 must be directed to the appropriate software vendor. You may click the publisher link of Webcam Surveillance Monitor on the top of this page to get more details about the vendor.